I'm looking forward to textile adventures aplenty in 2010. When I started this blog about 18 months ago, I was recovering from an operation on my left wrist and had very little use of either hand. In April last year, I had an operation on my right wrist. Both operations were very successful and I have slowly been getting back into the wonderful world of textiles. I currently have sewing, knitting, embroidery and quilting projects on the go (it didn't take me long to start lots of new UFOs). I made this quilt for Luke James, who was arrived just 2 weeks ago on 18 December. 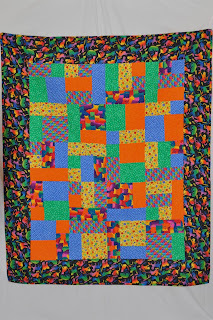 His mother is very fond of cats and appreciated the cat theme in the quilt. Happy New Year, Monica! Thank you for following my blog! Here in Canada it is still 2009! Happy stitching for 2010! Happy New Year Monica. It is so good to hear how successful the operations were. It must have been so frustrating for you. You are certainly making up for it now. I love the cat quilt.